Transformers Live Action Movie Blog (TFLAMB): War for Cybertron Optimus Prime Toy? War for Cybertron Optimus Prime Toy? If this image is true, it appears that Activision's Transformers: War for Cybertron video game may have a toy line to go with it when released this summer. 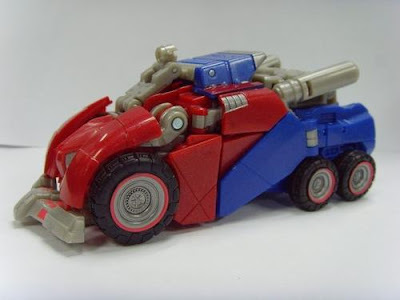 The image from S250 shows the vehicle mode of Optimus Prime from the game. Its potential class, release date and other specifics are unknown. Since Hasbro seems to want to treat the game as canon and the Revenge of the Fallen line will have run its course by summer, it does seem like a good way to fill the gap between now and whenever their next animated effort gets off the ground. Hopefully Hasbro will release something official soon to confirm what their future plans are for Transformers post ROTF. I saw this earlier and I was thinking that this one isn't transformed very well. Putting that aisde, I do like the futuristic other-worldly design to it. It really captures what the Cybertronians would probably have long before they adopt the Earth models of the 1980's to 2000's. I think you mean the other way round - the War for Cybertron toy range has a game to go with it (and TV series?). Does War for Cybertron have anything to do with the Transformers:Prime show? Toy Fair starts this weekend, so I wonder if they'll show some preview stuff for it or we'll have to wait another 3 months until BotCon. Hopefully they'll be some leaks!